Wrexham Peace & Justice Forum and supporters organised an anti-nuclear stall in Wrexham town centre on Monday 4 April, calling for the government to abandon plans to replace the Trident nuclear weapons system in Britain as well as all plans for a new generation of nuclear power stations in light of the unfolding nuclear disaster at Fukushima. 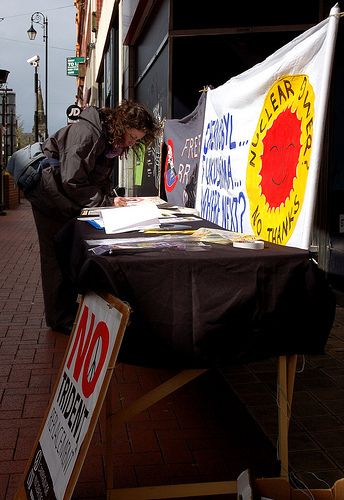 Those who stopped at the stall to express their opposition to nuclear weapons and nuclear power included war veterans, students and a woman from the Chernobyl area. Letter-writing materials were provided, along with information about five elderly ‘Disarm Now Plowshares’ nuclear resisters, recently imprisoned in the US for taking part in non-violent action against the largest store of nuclear weapons in the country, and about Bradley Manning, the young US soldier with Welsh connections – he went to school here and his mother and relatives still live here – being held in solitary confinement in a military jail in Virginia. Manning is accused of blowing the whistle on war crimes committed in Iraq and Afghanistan and suspected of leaking hundreds of thousands of US diplomatic cables that expose the dark underside of international relations. Documents which show existing concerns about the safety of Japan’s nuclear power plants. Cables from Belgium assuring the US that it can transport radioactive depleted uranium weaponry to Iraq and Afghanistan through Antwerp, even though this is against Belgian law. Many documents showing that nuclear materials are not secure and are frequently stolen, sold and moved around the world: such materials have, for example, been found in a casket in Burundi, in an Armenian car on the Georgian border and offered for sale by a retired Russian general in Portugal. “The incidence of cancers in Wales linked to radioactive emissions from nuclear plants has been well documented – for example, the cluster of childhood cancers which have occurred along the Menai Strait(1) and the increased incidence of cancers in all categories in the area around Trawsfynydd(2), so we can only imagine the devastating consequences for the people of Fukushima, Japan and the rest of the world of this major nuclear disaster. It is estimated that at least one million people have died worldwide as a result of the Chernobyl accident 25 years ago(3). We need to learn from our mistakes and realise that nuclear power is never going to be safe and that we simply do not know how to deal safely with nuclear waste, which continues to pose a health risk in the long term. There is also a very real risk of nuclear materials from power plants being stolen and trafficked around the world. “Bradley Manning is accused of releasing documents including some which reveal the truth about nuclear power and nuclear risks, yet he is being punished and tortured in the US, untried and unconvicted, for allegedly releasing documents like these which should never have been suppressed in the first place. 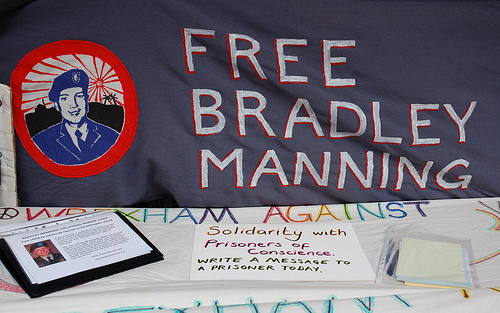 This is the second letter-writing session we have held in Wrexham for Bradley Manning, with peace activists and army veterans, workers, mothers, shoppers and students among those who have sent messages of support and solidarity. Free Bradley Manning! Concerned members of the public can write to Bradley Manning c/o Courage to Resist, 484 Lake Park Avenue #41, Oakland, CA 94610, USA. Wrexham Peace & Justice Forum can be contacted at wrexhamsaw@yahoo.com. Our next meeting will be held on Monday 18 April at 6.30pm, Quaker Meeting House, Holt Rd, Wrexham. “Chernobyl: Consequences of the Catastrophe for People and the Environment,” compiled by authors Alexey Yablokov of the Center for Russian Environmental Policy in Moscow, and Vassily Nesterenko and Alexey Nesterenko of the Institute of Radiation Safety, in Minsk, Belarus. Pub: New York Academy of Sciences, 2010.